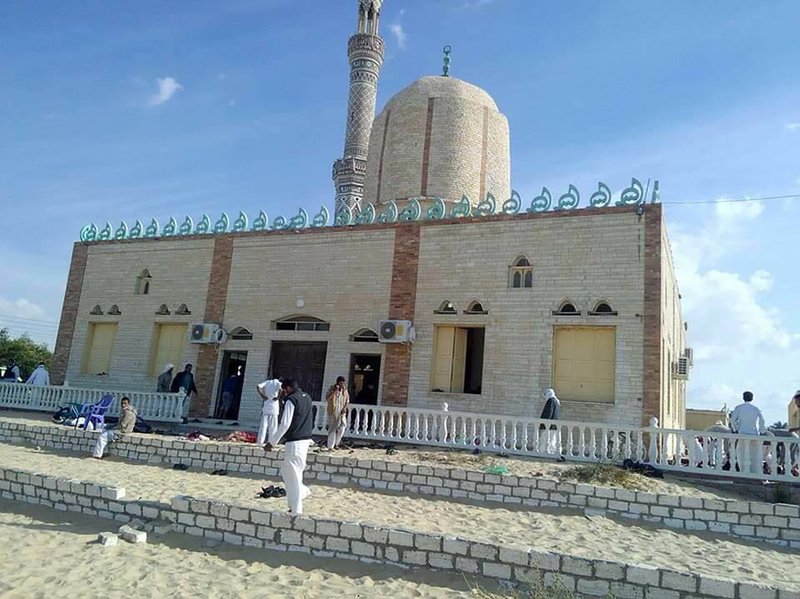 Egypt Sinai Peninsula Mosque Attack Kills At Least 305 At least 305 people died in the bombing and shooting attack by assailants against a mosque in the Sinai Peninsula during Friday prayers. A bombing and shooting attack during Friday prayers at a mosque in the Sinai Peninsula reportedly has killed at least 305 people. The region has been dealing with an Islamist insurgency for years. Chief Prosecutor Nabil Sadeq said in a statement Saturday that between 25 and 30 people carried out the attack after arriving in five all-terrain vehicles, according to The Associated Press. "Teams of attackers set off bombs and then opened fire as worshippers tried to flee," NPR's Jane Arraf reports. "Others used rocket-propelled grenades." "The Egyptian government launched airstrikes overnight on what it said were hideouts and fighters involved in the attack," she adds. The bombing and shooting attack took place in the town of Bir al-Abd, the AP says, located in the country's northeast not far from the border with the Gaza Strip. Police officers told the wire service on Friday that men in four off-road vehicles shot at worshippers who were at the al-Rawdah mosque for Friday prayers. Egyptian President Abdel-Fattah el-Sissi spoke to the country on state television, condemning the attack and encouraging the country not to lose hope. "The armed forces and the police force, will avenge our martyrs, and restore security and stability, with utmost force during the coming short period, this is our [response]," Sissi said. "We will respond [to] this act with brute force in facing those extremist terrorist [factions]." He ordered the government to allocate compensation to the families of the dead. He also announced three days of national mourning. Officials from around the world, including Israel, Iraq, France and the United Kingdom, condemned the attack. President Trump denounced the attack hours later and said he planned to call Sissi. Just before 5 p.m. ET on Friday, the White House confirmed Trump's call. The statement said Trump offered condolences to the president and his people while also condemning the attack. "The international community cannot tolerate barbaric terrorist groups and must strengthen its efforts to defeat terrorism and extremism in all its forms," the White House said. My condolences to the families of the dozens of people murdered in the terror attack on a mosque in the Sinai. Israel stands shoulder to shoulder with Egypt and other countries in region and the international arena in the war against radical Islamic terror. "Today's terrorist attack on worshippers attending Friday prayers at a mosque in Arish was an unconscionable act of cowardice and hate. The Embassy extends heartfelt condolences to the families of those who were killed and we wish a speedy recovery to those injured. As Egypt battles the scourge of terrorism, the United States stands committed to the safety and security of Egypt and its people." Egypt's State Intelligence Service released a statement outlining eight official "indications" from the attack saying emphatically that the true target of the terrorists was "the Egyptian people; their security, stability, sources of livelihood, the solid unity of all Egyptians and the lives of innocent people." It is not known yet who planned and carried out the assault on the mosque, but there has been an Islamist insurgency in the region for several years. Officials said a midair explosion of a Russian jet in 2015 over the Sinai was the work of terrorists. Sissi said the plane bombing was meant "to hit relations with Russia," which has conducted military interventions in Syria's civil war ostensibly to target the Islamic State there.